When selling products, there are certain events that raise the likelihood a customer will buy a product. A customer sees the inventory, that’s step one. They walk over to it and stop to look, step two. But once a customer actually touches the item, the likelihood of them making the purchase increases dramatically. 1. Keep an eye on the thermostat. Temperature is one of the main ways your customers feel your store. Keep your store warm in the winter and cool in the summer. The moment your customer walks through the door, they should feel comfortable if you want them to stick around and shop. Your store should typically be a bit cooler than the average temperature in your house to allow for the extra layers of outside clothes your customers wear in from outside. But don’t forget about the comfort of your employees, especially if they have to adhere to a dress code. This is also one of the main levers of power you have over how long people linger in your store. The colder it is in your store, the quicker your customers will go in and out. Depending on your business, you may actually prefer a quick transaction with minimal browsing, though. 2. Avoid overly elaborate merchandising. Eye-catching merchandising is nice, but it’s easy to get carried away. When you turn your displays into a work of art, your customers may be delighted, but it also means they probably don’t want to be the ones who undo all your hard work. The more there is to admire, the less the inclination to touch. So unless the sole purpose of the display is to delight your customers vs actually selling the product (which is also encouraged), it’s best to make merchandising displays a bit more straightforward. Consider the shelf placement of your items. The most popular product should be at eye-level. The most expensive should be on the top shelf. 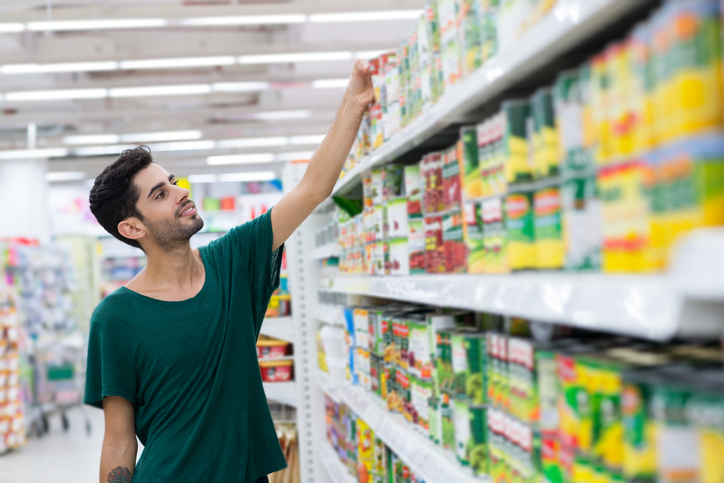 Low-margin/generic products should be on the bottom shelf. Childrens’ items should be at their eye-level. This makes it easier for your customers to touch what’s most recognizable and familiar to them. And by putting the expensive products higher, it’s a subtle indicator that it is a literal “step up”. If they’re after that higher quality, they’ll quickly begin scanning that top shelf, even if they started at eye-level. The extra stretch to the top shelf also makes it less likely they’ll put the item back. These are not hard and fast rules. Take a second to consider the product itself as well. For example, it’s probably not a good idea to put a back brace or products for elderly customers on the bottom shelf. Likewise, especially breakable or potentially hazardous products should probably not be on a shelf where small kids can easily reach them. Every now and then, come in as a customer and shop around in your own store. How easy is it? For example, do you offer baskets or carts? Are they clean and maintained? Are the floors sticky or slippery? Are some products out of reach? Putting yourself in your customers’ shoes is something every successful business needs to do on a consistent basis. Disney famously requires executives to spend a day at their theme parks in a character costume so they can get up-close and be at the product-level. Set high expectations as a customer. That will train you to set high expectations as business. What you feel when you shop at a store you love is what you want your customers to feel. So remember that golden rule. Do for your customers what you’d like done for you in any other store! What your customers detect with their skin is more than just what they knowingly touch in your store (although that’s a key part). Find ways to encourage your customers to touch the products you want them to buy. Once they touch it, they’re more likely to take it to the cash register. The more thought you put into your business, the more it shows. That’s what we’re trying to highlight in this series. Your customers only have a few ways to experience your business. Make sure you consider each of those ways and strategize accordingly. Strategies require data and that just so happens to be our specialty here at Shopventory. Right now, Shopventory offers plans for as low as 79¢ per day, with e-commerce hybrid options including Shopify or WooCommerce starting at under $1.69 per day. Right now, you can sign up for a no-risk 30-day full-featured free trial of Shopventory with no credit card required. We also back Shopventory with a 30-day money back guarantee. That means a total of 60 days risk-free! We’ll continue to the other senses in future posts, so stay tuned! Please take less than a minute to let us know what you think of the blog! We've put together a brief 40-second survey. Know a business owner who could use regular tips like these? Why not share this post with them? Donkey Kong soda display courtesy of raiian1 on Deviant Art. Check him out!